Researchers discovered intact red blood cells in the body of Ötzi the Iceman, a world-famous once-frozen natural mummy found in the Alps in 1991. Livescience called them the "world's oldest blood cells. 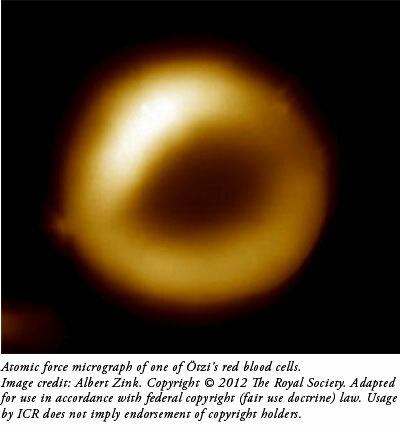 "1 But clear evidence shows that other blood cells hold the real record. Now, scientists discovered intact red blood cells in tissue samples from a wound that his hand suffered, as well as the arrow wound to the chest. Their research appeared in the Journal of the Royal Society Interface, where the authors wrote "It was initially assumed that the blood had disintegrated owing to autolysis within the corpse. "2 Autolysis is the process where oxygen, which is especially abundant within oxygen-carrying red blood cells, reacts with and fragments the proteins that comprise cells. Few, if any, expected that red blood cells could have persisted within Ötzi for perhaps thousands of years until today. What appeared to be red blood cells were probed with two techniques to ensure their identity. Atomic force microscopy and Raman spectroscopy both clearly confirmed Ötzi's red blood cells, according to the report.3 But in contrast to the news headlines, they do not appear to be the oldest. 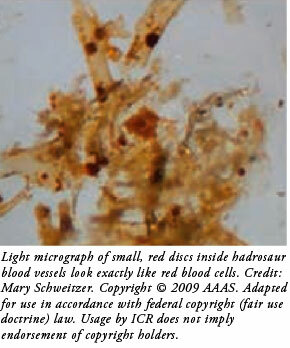 But red blood cells from even earlier specimens have appeared under paleontologists' microscopes. 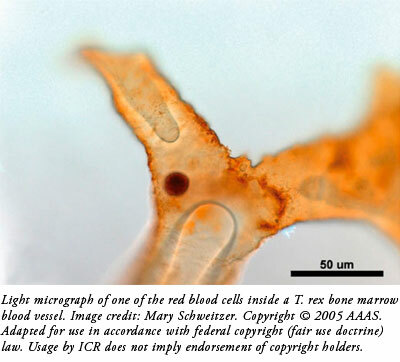 Totally unexpected, the bone marrow of a T. rex recovered in 1990 from Montana had what appeared to be red blood cells. Their story was recounted in Earth magazine. 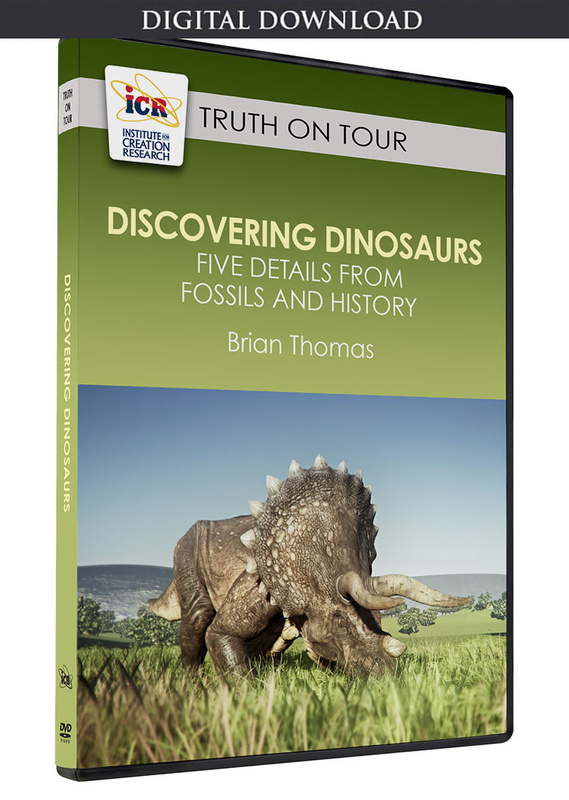 Of course, both the T. rex and hadrosaur are widely believed to be tens of millions of years old. Any red blood cells should have long since disintegrated. The Ötzi study even verified that his blood cells had lost much of their integrity by comparing the Raman scans with those of modern blood samples. But not only did the dinosaur bone marrow results show clear pictures of red-colored, round disks inside blood vessels, they also detected hemoglobin.7 Why are these not the rightful record-holders for oldest blood cells? Since the dinosaur fossils formed as a result of Noah's Flood, which produced the Alps mountain range that Ötzi later walked upon, the dinosaur red blood cells are older than Ötzi's by perhaps a millennium or two. In order to maintain belief in millions of years, those who insist that Ötzi's are the oldest blood cells must ignore the dinosaur data. Pappas, S. 'Iceman' Mummy Holds World's Oldest Blood Cells. LiveScience. Posted on livescience.com May 1, 2012, accessed May 4, 2012. Keller, A., et al. 2012. New insights into the Tyrolean Iceman's origin and phenotype as inferred by whole-genome sequencing. Nature Communications. 3: 698. Janko, M., R. W. Stark, and A. Zink. Preservation of 5300 year old red blood cells in the Iceman. Journal of the Royal Society Interface. Published online before print, May 2, 2012, accessed May 4, 2012. Seidler, H., et al. 1992. Some anthropological aspects of the prehistoric Tyrolean ice man. Science. 258 (5081): 455–457. Sherwin, F., and B. Thomas. 2010. 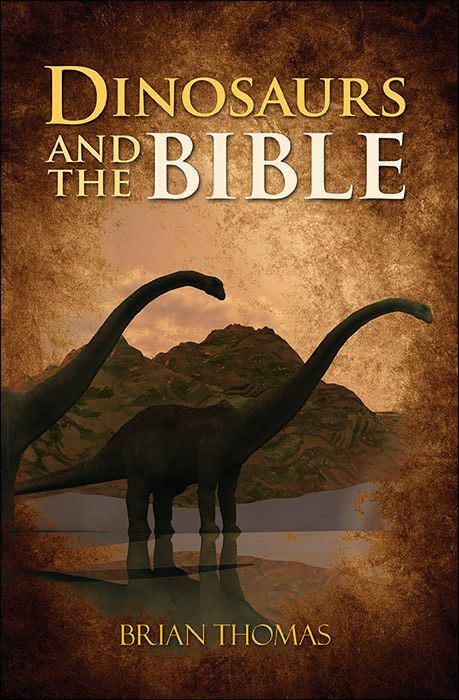 Understanding Evidence for the Biblical Timescale. Acts & Facts. 39 (4): 16-17. Schweitzer, M., and I. Staedter. 1997. The real Jurassic Park. Earth. 55–57. Schweitzer, M., et al. 2005. Soft-Tissue Vessels and Cellular Preservation in Tyrannosaurus rex. Science. 307 (5717): 1952-1955. Schweitzer, M., et al. 2009. Biomolecular Characterization and Protein Sequences of the Campanian Hadrosaur B. canadensis. Science. 324 (5927): 626-631. Wieland, C. 1997. Sensational dinosaur blood report! Creation. 19 (4): 42-43. Image credit: Samadelli Marco/EURAC. Copyright © 2012 The Royal Society. Adapted for use in accordance with federal copyright (fair use doctrine) law. Usage by ICR does not imply endorsement of copyright holders. Article posted on June 13, 2012.